Jamie Dutcher puts a disc in the CD player, and you freeze. The sound is composed of ice and blood and hot breath, beautiful and terrifying. When you hear a pack of wolves calling, you don’t pay attention to anything else. Jamie and her husband, Jim―filmmakers from Ketchum, Idaho―know wolves. What the producers of MTV’s Real World are to human 20-somethings, the Dutchers are to wolves. Their latest book, Living with Wolves (which contains that CD of wolf calls), and their film of the same name inspire difficult questions about 21st-century life in the West. How much of our world do we want to share with the animals―particularly the predatory animals―who were here before us? “I’ve always been interested in animals that are hard to film,” says Jim, who has been making animal documentaries for three decades. In the wild, it’s impossible to film wolves’ social behavior up close, so the Dutchers put together their own wolf pack, acquiring captive pups in Montana, then relocating them to a 25-acre compound in Idaho’s Sawtooth Mountains. The species the Dutchers chose to film has perhaps the scariest rep in the animal kingdom. “It’s the whole darn Little Red Riding Hood thing,” says Jamie. Never mind that, in the United States, recorded wild wolf attacks on human beings are almost nonexistent; wolves terrify us. The Dutchers spent six years living in yurts on the compound, recording whatever the wolves were doing. The wolves were, obviously, aware of the cameras and tape recorders and humans operating them. But, the Dutchers believe, the wolf pack still behaved much as one would in the wild. The resulting book and film are, basically, amazing. “They’ve got such personality,” says Jamie. “Goofy one minute, regal the next.” While a wolf pack’s organizational structure is brutally hierarchical―for example, in most cases only the alpha male and female mate―the animals are capable of surprising affection and compassion. When the Dutchers undertook their project, there were hardly any wolves left in the United States outside of Alaska. The U.S. 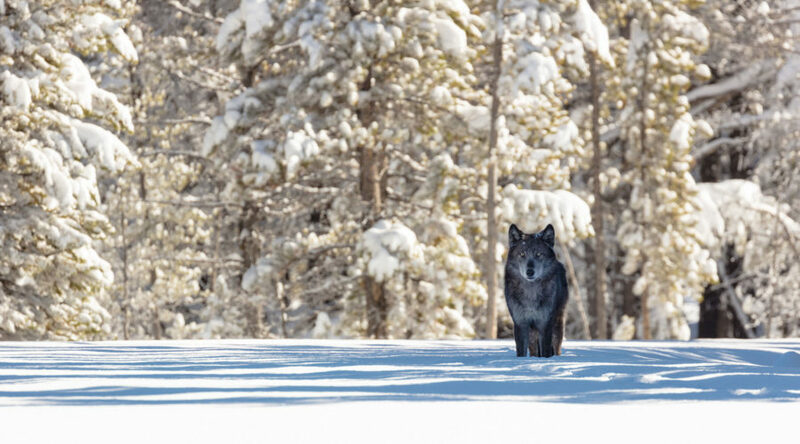 Fish & Wildlife Service and other agencies began programs to bring back wolves to the Northern Rockies. These programs stirred up enormous controversy. Part of it, the Dutchers realize, is economics. Ranchers have an understandable aversion to predators eating their cattle. But part of it is emotional: The Dutchers see that even in their hometown. The wolf relocation programs have had a mixed record, the Dutchers think. Around Yellowstone National Park, they’ve been enormously successful. (“It’s fantastic,” says Jamie, “people have a place to see wolves and not interfere with them.”) In Idaho, perhaps less so. Their Sawtooth wolf pack is no more. After filming, the Dutchers knew the wolves were too accustomed to humans to survive in the wild. They relocated the pack to a wolf center in northern Idaho. Because wolves live only about 10 years, just a few of the animals survive today. It is, the Dutchers say, hard to visit them. But it’s even worse to think that as the West fills with people, the call of the wolf will be harder to hear. INFO: Go to www.mountaineersbooks.com for the book Living with Wolves (The Mountaineers Books, 2005; $35); visit www.discovery.org for the Living with Wolves DVD ($22).